Horse back riding lessons Pony parties and horse camp. If you’re thinking about taking horse riding lessons or have decided to do so, you’re in for a real treat. Whether you have serious equestrian related ambitions, simply want to try something new, or just love horses, taking lessons is a fun and healthy activity and will ensure you get off on the right hoof…er…foot. Just like with any sport, you have to learn the fundamentals of horses and riding before you can move on. When you start with beginner riding lessons, you can expect to come out with a basic understanding of the animals and the sport. While horses and riding is a ton of fun, there are things you should know that are important for your safety, the horse’s safety, and the safety of others riding with you. International rider, Jim Milton, has combined the best teaching methods of professional instructors in the world to develop an efficient system which quickly teaches beginner riders the basics of horseback riding. Learn the Horse Riding Successful Formula by Clicking Here. Do I need to wear or bring anything? A saddle pad underneath the saddle to protect the horse’s back. What Will I Learn in My Lessons? The skills you will learn with beginner horse riding lessons are the fundamentals of the sport. Whether you continue with your riding or stop at this level, the skills you learn are vital. Mounting: In order to ride a horse, you have to know how to get on a horse. 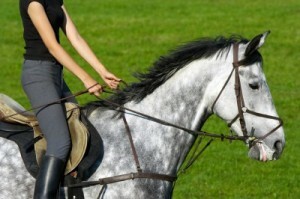 Your instructor will show and teach you the correct and safe way to mount and dismount a horse. Balance and Control: Once you’re on the horse, the next skill you’ll learn has to do with balance and control of your body. In order to ride and be one with the horse, you have to develop your seat and center of balance. One of the most important parts of developing your balance and harmony with the horse is learning how to “post.” Posting is the motion that allows you to get off of the horse’s back and move in harmony with him while he’s trotting. Stopping and Steering: Once you’ve developed your balance, you’ll then be taught to stop and steer the horse. Stopping and steering are essentials to correct and safe riding. The Aids: Once you’ve developed your seat and have learned to stop and steer, you’ll learn how to ask the horse to walk, trot, canter, and halt. I Don’t Understand What They Are Saying! Sometimes riders seem to be speaking in a language of their own. Don’t feel left out of the conversation and learn the basic terms so you can follow your teacher’s instructions. Beginner riding lessons can be considered the “gateway” to riding and consist of the skills that will be the foundation for any rider’s riding career.